The days are lengthening. The snowdrops are out and have been for a week or more. The birds are busy in the trees – I’m sure that I saw a magpie with nest building material in its beak last week. At the weekend foul weather and domestic duties kept me from taking advantage of the improvements, but on Tuesday after work I took a scenic route back from the train station. I climbed uphill by the road and then turned through Fleagarth Wood. On another (fairly) recent walk from the train station I walked with Mike, who used to be our neighbour (and who supplied the boundary riding postcard I posted recently). He asked whether I had noticed the spot along the Row where a dog fox crosses the road regularly. Had he seen it? No. Then how did he know? Because of the smell. When we reached the place Mike was referring to, by Bank Well, sure enough there was a faint but distinctively sharp scent. Now I thought that I could detect the same aroma in Fleagarth wood, but when I stopped to sniff again it seemed to be gone. On Sunday evening, driving home from a family trip to the swimming baths, we saw a fox cross the road ahead – so they are about – just very elusive. 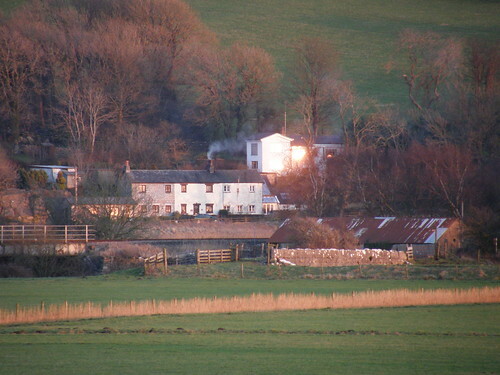 When I emerged from the woods on the edge of the salt marsh, Warton Crag was glowing golden in the late sun and a window at Crag Foot was catching the sunlight and throwing it back like a signalling mirror (see above). 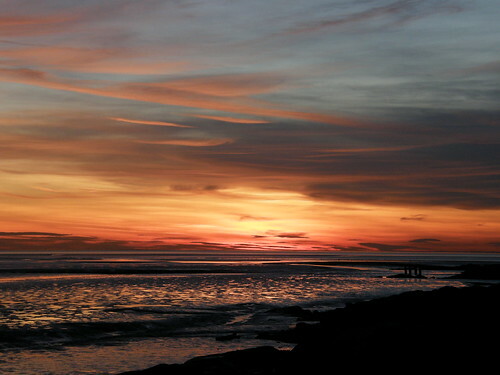 Although I was enjoying the light I was a little disappointed – the golden glow spread southwards along the coast, lighting the windows of the buildings along the sea front at Morecambe and previous experience led to me to believe that I would miss the sunset as I wouldn’t reach Jenny Brown’s Point quick enough to see it. 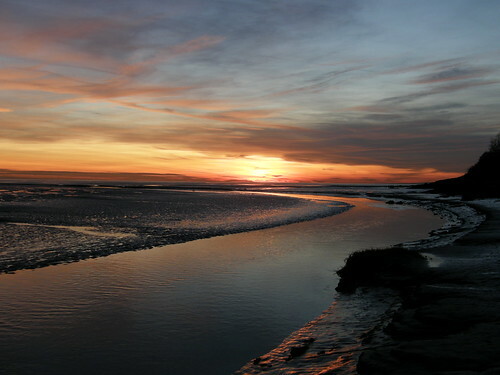 I hadn’t factored in the time of year – the sun set further south in the western sky than I had anticipated and I had a chance to watch it from the muddy bank of Quicksand Pool, by Jenny Brown’s cottages. By the time I did reach Jenny Brown’s Point the sun was gone, but it had left fabulous colours in the sky to soften the blow of its departure. This afternoon the light was superb once again, the best view being of Warton Crag again as we passed it in the train – the trees amber in the sunlight and the sky behind egg-shell blue with huge scraps of blue-black clouds. This time I took a route through Eaves Wood, where there has been more tree felling and scrub clearing up by the Ring of Beeches.